Together with Robert Dale we organize and chair the Workshop on Computational Linguistics and Writing: Cognitive and linguistic aspects of document creation and document engineering (CL&W 2012) to be held at EACL 2012 in Avignon, France, in April 2012. See the CL&W website for more information. The proceedings are available online aht the ACL Anthology. Together with Robert Dale we organized and chaired the Workshop on Computational Linguistics and Writing: Writing Processes and Authoring Aids (CL&W 2010) held at NAACL HLT 2010 in Los Angeles, USA, on June 6, 2010. See the CL&W website for more information. The proceedings are available online at the ACL Anthology. 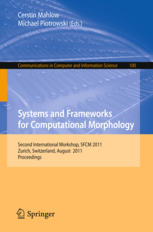 As a “side-effect” of our research in the LingURed project we organized and chaired the Workshop on Systems for Computational Morphology (SFCM 2009 and SFCM 2011) in Zurich on September 4, 2009, and on August 26, 2011. See the SFCM website for the talks of SFCM 2009. The proceedings are published by Springer Verlag in their CCIS Series (Communications in Computer and Information Science) as Volume 41 and Volume 100. In fall semester 2009 we taught a seminar on “Making Word Processors Process Words – Language Technology for Authoring Aids” together with Michael Hess at the University of Zurich. You can see the public portion of the corresponding e-learning course in OLAT. We had several talks by guests: Sabine Lehmann from acrolinx GmbH, Michael Zock from the CNRS, Ola Knutsson from the KTH, Daniel Perrin from the ZHAW. The talks have been recorded and made available. You can access them from SWITCHcast.